Vaccines stimulate your body to produce immunity against a disease. Some use live viruses while others use inactive or killed viruses or bacteria. For some diseases, both versions are available and each is recommended for a different population, such as those who are immunocompromised. You may have questions as to whether you would be contagious for the disease after getting a live vaccine due to viral shedding. Live vaccines are safe, with some precautions, especially when compared with the risk getting the disease itself and spreading it to others. Live vaccines contain a weakened or attenuated form of a virus or bacteria. This is, in contrast, to "killed" or inactivated vaccines. It might sound frightening at first to realize that a vaccine contains a weakened virus or bacteria, but these are altered so that they cannot cause disease—at least in people with healthy immune systems, and the majority of people without a healthy immune system as well. If a child (or adult) has a suppressed immune system, live vaccines are not given. Where this could potentially be a problem is with shedding. After receiving the vaccine, some of the weakened viruses will travel through the body and can be present in bodily secretions such as feces. The other main type of vaccine is made of the inactivated virus or bacteria (whole vaccine) or just parts of the virus or bacteria (fractional vaccine). Live vaccines are thought to better simulate natural infections and usually provide lifelong protection with one or two doses. Most inactivated vaccines, in contrast, require multiple primary doses and boosters (years later) to get the same type of immunity. 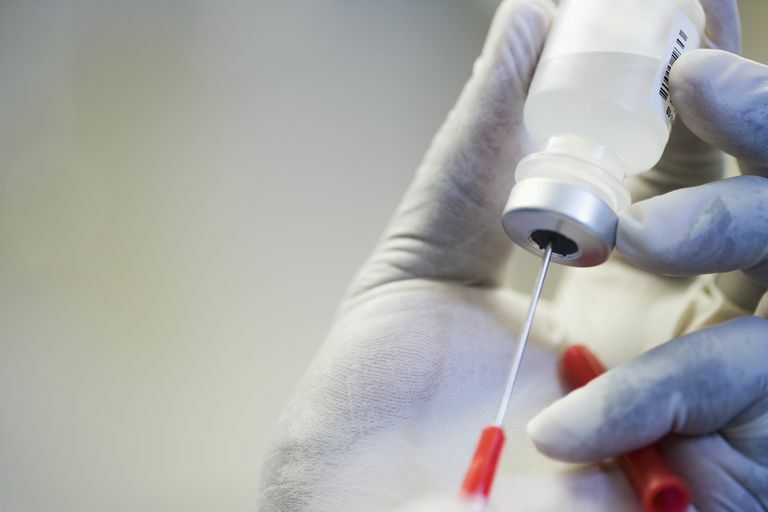 In some types of live vaccines, a second dose is given because some people don't respond to the first dose, but that is not considered to be a booster. Children have been getting live vaccines for many years, and these vaccines are considered to be very safe for those who are healthy. In fact, one of the very first vaccines, the smallpox vaccine, was a live-virus vaccine. Due to widespread vaccination, the last natural case of smallpox occurred in 1977 (there was a case due to a laboratory accident in 1978) and the disease was declared to be eradicated worldwide in 1979. Typhoid vaccine: The oral typhoid vaccine is made with a live-attenuated strain of Salmonella typhi, the bacteria which causes typhoid fever. An inactivated, injectable version of the vaccine is also available. Either typhoid vaccine would only be given to travelers to high-risk areas. BCG: The bacilli Calmette-Guerin tuberculosis vaccine is not routinely used in the United States because it mainly prevents severe TB, a disease uncommon in the United States. Oral polio vaccine (OPV): The original OPV (Sabin vaccine) was a live vaccine and has been replaced in the United States by the inactivated polio vaccine (Salk vaccine.) Prior to using the injectable polio vaccine, there were a few cases of polio each year in the United States felt to be due to the vaccine. The only live virus vaccines that are used routinely include the MMR, Varivax, Rotavirus, and Flumist (the injectable flu shot is preferred for those who are high risk). Although live vaccines don't cause disease in the people who get them because they are made with weakened viruses and bacteria, there is always a concern that someone with a severely weakened immune system could get sick after getting a live vaccine. That is why live vaccines are not given to people who are getting chemotherapy or who have severe HIV, among other conditions. Whether or not you give a live vaccine to someone who has a problem with their immune system depends greatly on exactly what condition they have and the degree of their immunosuppression. For example, it is now recommended that children with HIV get the MMR, Varivax, and rotavirus vaccines, depending on their CD4+ T-lymphocyte counts. Parents sometimes have a concern about whether their healthy children should get live vaccines if they will be exposed to someone else who has a problem with their immune system, especially if they are in close contact with someone that has compromised immunity. Fortunately, except for OPV and smallpox, which aren't typically used anymore, children who live with someone who has an immunologic deficiency can and should get most vaccines in the routine childhood immunization schedule, such as MMR, Varivax, and the rotavirus vaccines. It would be extremely rare for someone to contract one of these viruses from someone who got the vaccine. A much greater concern than live vaccine shedding of a weakened strain would be that the unvaccinated child might get a natural infection with measles or chicken pox and pass that on to a person with an immune system problem. "Close contacts of patients with compromised immunity should not receive live oral poliovirus vaccine because they might shed the virus and infect a patient with compromised immunity. Close contacts can receive other standard vaccines because viral shedding is unlikely and these pose little risk of infection to a subject with compromised immunity." Unless the child will be in contact with someone who is severely immunosuppressed, such as getting a stem cell transplant and being in a protective environment, the child can even get the live nasal spray flu vaccine. The concern in any of these cases is viral shedding, in which someone becomes contagious and can pass a virus to someone else. When you get sick with a cold, the flu, a cold sore, or any other contagious disease, it is not uncommon that you spread it to other people by shedding the virus or bacteria that is making you sick. With true vaccine shedding, like with the oral polio vaccine (which is not used in the United States), the vaccine virus can be shed after being vaccinated even though you didn't get sick with the virus. Fortunately, when most others are exposed to vaccine virus, they don't get sick either, as they have been exposed to the weakened vaccine strain of the virus. This was actually thought to be an advantage of the oral polio vaccine, especially in areas with poor sanitation and hygiene as it would give immunity to others exposed. Still, vaccine shedding can be a problem if the person who is exposed has a severe immune system problem. Most vaccines are not live and don't shed, including DTaP, Tdap, flu shots, Hib, hepatitis A and B, Prevnar, IPV, and the HPV and meningococcal vaccines. The oral polio vaccine is no longer used in the United States and many other countries where polio has been brought under control. The MMR vaccine doesn't cause shedding, except that the rubella part of the vaccine may rarely shed into breastmilk. Since rubella is typically a mild infection in children, you could be vaccinated if you are breastfeeding. It is extremely rare that a person would transmit the vaccine virus to another person after developing measles in this way. A systematic review of the MMR vaccine in 2016 "determined that there have been no confirmed cases of human-to-human transmission of the measles vaccine virus." The chicken pox vaccine doesn't cause shedding unless your child develops the rare vesicular rash after getting vaccinated. The risk, however, is thought to be minimal and the CDC reports only five cases of transmission of varicella vaccine virus after immunization including over 55 million doses of vaccine. The rotavirus vaccine only causes shedding in the stool and can be avoided with routine hygiene techniques, such as good hand washing. An immunocompromised person should avoid changing diapers for at least a week after a child gets a rotavirus vaccine. Transmission of the live, nasal spray flu vaccine has not occurred when evaluated in several settings, including people with HIV infection, children getting chemotherapy, and immunocompromised people in health-care settings. And of course, children shed viruses and are truly contagious if they aren't vaccinated and naturally develop any of these vaccine-preventable diseases. Multiple live-virus vaccines can be given at the same time, but if they aren't you should wait at least four weeks before getting another live-virus vaccine so that they don't interfere with each other. It is usually recommended that children who might be getting a solid organ transplant be updated on their live-virus vaccines at least four weeks before the transplant. In addition to children getting chemotherapy, children who are getting daily steroids for 14 days or more should delay getting live vaccines for at least three months. Rather than being at risk for infection, this recommendation is usually made because the vaccine simply won't work if a person is on steroids. Live vaccines are reportedly being developed to protect against West Nile virus, respiratory syncytial virus (RSV), Parainfluenza virus, Herpes simplex, cytomegalovirus (CMV), and the Dengue virus (breakbone fever). The CDC states that the yellow fever vaccine should be avoided if you are breastfeeding, but "when nursing mothers cannot avoid or postpone travel to areas endemic for yellow fever in which risk for acquisition is high, these women should be vaccinated." The precaution follows three cases of yellow fever vaccine–associated neurologic disease in exclusively breastfed babies of vaccinated mothers. Vaccine shedding does not cause outbreaks—a frequent anti-vaccine myth. Most of the live virus vaccines used routinely pose little problem for a child and little risk of viral shedding which could lead to disease in others who may be immunocompromised. People may have heard of the rare risk of developing polio (vaccine-associated paralytic poliomyelitis) from the oral polio vaccine, but that vaccine is no longer given in the United States. There are a few precautions to consider, such as in the setting of a stem cell transplant. What poses the most risk all the way around is when those who are not immunized develop these actual infections. If you have any concerns about your child getting a live vaccine, especially if your child or someone else at home has a problem with their immune system, be sure to talk to your pediatrician. Doherty, M., Schmidt-Orr, R., Santos, J. et al. Vaccination of Special Populations: Protecting the Vulnerable. Vaccine. 2016. 34952):6681-6690. Kliegman R, Stanton B, W. SGJ, Schor NF, Behrman RE. Nelson Textbook of Pediatrics. Philadelphia, PA: Elsevier; 2016. Lopez A, Mariette X, Bachelez H, et al. Vaccination Recommendations for the Adult Immunosuppressed Patient: A Systematic Review and Comprehensive Field Synopsis. Journal of Autoimmunity. 2017. 80:10-27. Medical Advisory Committee of the Immune Deficiency Foundation, Shearer, W., Fleisher, T. et al. Recommendations for Live Viral and Bacterial Vaccines in Immunodeficient Patients and Their Close Contacts. Journal of Allergy and Clinical Immunology. 2014. 133(4):961-6.